Paladins are a healer class with balanced ATK and DEF from a powerful weapon and sturdy shield. Uses divine powers to attack and various skills to heal. Suitable for beginners. - Total STR and STA stats: Keep them around 70%~60% STA; and 30%~40% STR. Yup, you still need STR. - OR 2 STA and 1 STR (Awakening Points: 3 STA and 2 STR) - Total STR and STA stats: Keep them around 50% STA; and 50% STR. - HP: as high as possible (Stamina+, HP+). - ATK: as high as possible, aim around 1700+ (STR+, ATK+, Stamina+). - DEF: collect and upgrade your gears to get the DEF bonuses, if you need more, get (Stamina+, DEF+). Aim for 700+ or 800+ for Chapter 8 and 9 Normal. - CRIT RATE: just aim near 40% if you can (CRIT RATE+%, STR+). - Evasion: getting this to around 40% will also help dodge some attacks (Evasion+%). - CRIT DMG: just get what you can for now, make sure to cover CRIT RATE first before increasing. - MP: leave it for now, or just get the bonus MP+ from Necklace upgrade bonus. - Accuracy: 120+ to 130+ should be fine. - Unlock Hero Mode First. Note that monsters from here on are stronger than before so it is normal to grind if you get stuck. - Reminder: Upgrade your gears (especially weapon), battle pets (summon for boss fights), fairies, increase awakening stars, and upgrade some Seals. - ATK: as high as possible (STR+, ATK+, Stamina+). - DEF: collect and upgrade your gears to get the DEF bonuses, if you need more, get (Stamina+, DEF+) stats. Aim for at least 2000+ DEF for Chapter 9 Hero Mode, more if you want. 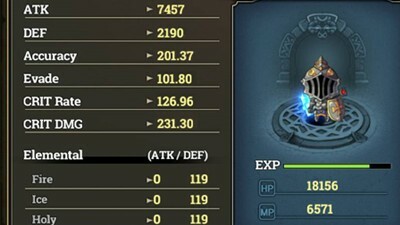 - CRIT RATE: just cap it around 100% first (CRIT RATE+%, INT+), increase if you want more but do not exceed far from 200%. - CRIT DMG: as high as possible, aim for at least 100%+ to 150%+ around Lvl 50, and 250%+ around Lvl 60. (CRIT DMG+%, INT+). It is also ok to limit this one to 100% to 200% if you want, to focus more on other stats. - Evasion: Just cap it around 70% first (Evasion+%). Increase at later Lvls to around 100% or 150% to evade some attacks. - Accuracy: Only increase if you miss a lot in PvE, or increase to around 200+ to 250+ for PVP purposes (Stamina+, Accuracy+). If you are a PVP enthusiast , you need to increase this more, unless the meta changes and everyone drops their Evasion. - MP: Just get the bonus MP+ from Necklace upgrade bonuses, and MP Seals. - Don't forget to upgrade some of your SEALS too. - If you reached this point, you probably know now what you are doing. - Note: Stats above are not fully optimized, there is still room for improvement. Add in more stats according to your needs or play style. - Reflect+%: This could be a game changer at higher levels, add in to your T12 Weapons and/or T10+ Amulets. This stat will reflect incoming damages back to the enemy depending on the percentage of your Reflect stat! Important Note! 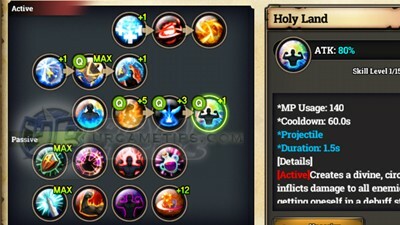 - Due to the new revamped skills update, the skill build below is not 100% working. I will update this guide once they release the final patch notes of the revamped Skills and Stats. By default, skill sets below are focused for PVE or leveling purposes. Note that this is not the only way to build your skills! There are so many skill builds around that is also viable. - Method: Similar to Slashers, right after your Paladin's first attack animation, quickly move your character to any direction to reset the attack animation, then just spam repeat until all monsters are dead. Start by going into 1 direction (Back > Slash > Back > Slash is easier and faster to practice), do this to avoid some damages and possible stuns. - If you are seeing a bunch of red numbers stacking while moving, and not getting any hits, then you are doing it right. Practice on Chapters 5/1, 7-1 or 7-8 for example. *After the v1.0.8 update patch, you can start farming Soul Stones from the Fairy Tower at Lvl 10. It's way easier now, so Awaken your character as fast as possible. Enhance your Fairies also with Fairy Dusts and evolve to get more stats! - Gather mobs then use Hammer Poll to deal great damages. Note that during the animation, your hero is invulnerable from enemy attacks, use this to avoid powerful boss attacks later. Also remember that Hammer Poll can stun and disrupt healing boss monsters, just time it well. - Go with Hammer Poll, Great Sacrifice, Holy Cross, and Divine Protection. - Sac > Cross > Hammer. If your Cross knocked backed the monsters, do a quick dash before Hammering them. - Use Divine Protection to increase DEF and deal splash damages, nice after using the combo above. Works great with battle pets too! - Also try to get a Necklace asap to increase your MP pools. Stay at Lvl 3 Hammer Poll until you get one...but if your MP can freely support the combo above, upgrade Hammer Poll to 4 or 6 and Divine Protection to 3 or 5, depending on your MP pool. You should always be able to freely spam the combo. - Do not use Blessed Novelties though if you still have lots of HP potions, balance it to save some MP pots. - Clear 2 mobs per map here, wait for the cooldowns of your skills before taking on the next monster mob or before entering maps. - The 2nd combo above works well here, you can also use Divine Protection first to gather mobs, then use Sac > Hammer to clear them. - Another method is to dive into the mob and use [Sac > Hammer > Divine] then [Sac > Hammer > Blessed Novelties], nice for boss fights too. - The key is to try to save as many pots as possible for all boss fights. If you can't, upgrade everything that needs upgrading. - Monsters are stronger now, continue and upgrade everything. - Continue and use the combos above. - If needed, clear monsters one by one or by group to save pots, and do Fast Normal Attacks while avoiding enemy attacks. - Same, just go closer and hit them from their blind spots. - Great damages as long that the enemy is inside the chronosphere, too bad bosses tend to flee when their HP is getting low...unlike AI PvP matches where...you know hehe. - The chronosphere lasts for around 6 seconds I think, if no monsters are around. - As usual, wait for their CDs before entering another map. - Passive Master = MAX Lvl 15 (increases the base bonus stat of all passive skills except Vengeance, a nice skill at higher levels.) Reserve or put Skill Points here, and wait until it is fixed. Passive Master is NOT working at the moment, stats doesn't increase at certain Lvls after Lvl 1. - Also a great skill for PVP and Raids. Just get Lvl 1 if you want, including Power of Punishment. - A nice passive skill for Full STA builds at higher levels, put your remaining points here. - Once you are done with the story line and all available modes, it's time to reach the Max Lvl. - Continue or reconfigure your skills for Auto-Battle Grinding, then reset again if you want for PVP builds last. Experiment and have fun! 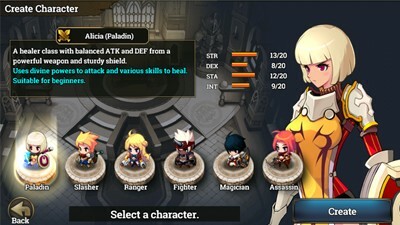 - For higher levels auto grinding build, add in any skills you want next. - Yup, this one requires skill resets, but optional.